Astro-Vision is a pioneer in astrology software development and its flagship software, Astro-Vision LifeSign 14.0 is used by over 10,000 satisfied customers. Our users include astrology centres, business centres, Internet cafes, STD /PCO booths, Xerox centres, Marriage bureaus, astrology classes, and astrologers around the world. Our astrology software enables our clients to offer computerised astrology services commercially. Our vast client base bears testimony to the fact that Astro-Vision LifeSign is the best astrology software available. Astro-Vision LifeSign 14.0 offers accurate and complete horoscope calculations and predictions. Our astrology software is based on the Indian system of predictive astrology. With Astro-Vision LifeSign 14.0, you can start earning income from day one by providing detailed horoscope predictions in various languages to your customers. If you already own a home based business or a DTP centre, an internet Cafe or PCO booth, Astro-Vision LifeSign 14.0 astrology software provides an ideal way to increase income by providing horoscope services to your existing customers. Shopkeepers and vendors will also find this astrology software extremely useful to earn high returns on your investment. Astro-Vision LifeSign 14.0 gives you the option to customise the Horoscope reports as required; e.g., as a single-page horoscope report, horoscope report with charts and calculations only, horoscope report with detailed predictions, etc. You can even choose from the templates available in Astro-Vision LifeSign 14.0. This will help you deliver different types of horoscope reports at various prices to your customers. The typical rates range from INR 750 to INR 10 depending on the type of report. Astro-Vision Software LifeSign 14.0 is available in multiple languages - English, Hindi, Tamil, Malayalam, Telugu and Kannada. So you can provide astrology services to clients across India. This feature also makes it one of the most sought after Hindu astrology software. Astro-Vision LifeSign 14.0 also provides you a choice of chart formats, like, North Indian, South Indian, Bengali, Kerala and Sri Lankan chart styles. This means you can generate horoscope reports from Astro-Vision Software according to the individual requirement of your customers. Prepare horoscope reports and save it to a CD, Floppy, Hard disk or simply take a print out. You can also send this report to customers through mail, so they can view and take a printout of the report at their convenience. This increases your scope and area of operations. The user interface is simple and intuitive. You don't require any prior knowledge of Vedic Astrology to be able to use Astro-Vision Software. Astro-Vision provides prompt after-sales support through Email and telephone. Our extensive network of Branches, Dealers and Distributors also provide support for the various Astro-Vision astrology software products. Astro-Vision LifeSign Horoscope includes Panchanga predictions based on the weekday, predictions based on the birth star, predictions based on the tithi, i.e lunar day, predictions based on the karana and predictions based on the Nithya Yoga. Analysis of the second house, for predictions on wealth, land and property. Analysis of the third house, for predictions on siblings. Analysis of the fifth house, for predictions on children, mind, intelligence. Analysis of the sixth house, for predictions on diseases, enemies, obstacles. Analysis of the eighth house, for predictions on longevity, difficulties. Analysis of the tenth house, for predictions on profession. Analysis of the eleventh house, for predictions on income. Analysis of the twelfth house, for predictions on expenditure and losses. Astro-Vision LifeSign Software gives detailed predictions based on the effect of the Dasa and Apahara starting from the current dasa onwards. Predictions for apahara ( bhukti ) are also given for twenty five years. The time frame of each apahara is also given. (the first five years of life is skipped). While analysing the effect of the Dasa and Apahara, the strength of planets is judged by their positions in Sapta Varga. Astro-Vision LifeSign Software gives remedies based on the birth star. Remedies include suggested places of worship to visit, appropriate dress to wear and ideal mantras to be chanted. Unfavourable dasa periods and the remedial rites to be observed during that period are also given. These remedies include suggested dress to be worn during the dasa period, devata bhajanam, morning prayers to be chanted along with specific instructions to be followed while chanting, if any. Fasting to be observed along with specific instructions about the kind of food that one can eat. Suggestions are also given on alms or charity to be done and poojas to be performed during the period of the harmful dasa. Mantras to be chanted during the dasa period are also given. All the remedies suggested are also mentioned with the time during which they need to be followed. Astro-Vision LifeSign astrology software provides a Transit prediction based on the comparison of the present position of planets with those in the birth chart. This is used to predict the immediate future. Astro-Vision LifeSign Software indicates the favourable periods for career within the various dasa and apahara periods. Astro-Vision LifeSign Software indicates the favourable periods for marriage within the various dasa and apahara periods. Astro-Vision LifeSign Software indicates the favourable periods for Business activities within the various dasa and apahara periods. Astro-Vision LifeSign Software indicates the favourable periods for House Construction within the various dasa and apahara periods. Our computer horoscope software provides predictions based on the Ashtakavarga system. The Ashtakavarga system is a predictive method of Indian Astrology that uses a system of points based upon planetary positions. Astro-Vision LifeSign Astrology Software is one of the few Indian Astrology Software products providing such Astrology predictions. The important combinations which result in a yoga are identified in the horoscope and are listed with a brief mention of the effect it can have. While listing the Yogas, the combinations which resulted in the yoga are also given for easy reference. Calculates the birth star and also provides the entire list of associated star qualities. 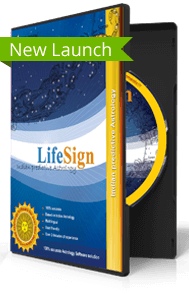 All charts, calculations and analysis provided in this LifeSign Horoscope software are based on Vedic Astrology. The nirayana longitude of the planets, the rasi, the longitude in the rasi, the star as well as star pada is calculated. The Star, star lord, sub lord as well as sub-sub lord is calculated for each planet. The dasa as well as dasa balance at birth is also provided along with the rasi chart and navamsa chart. Astro-Vision LifeSign also provides the bhava chart as well as the bhava table. Various charts are prepared after making the necessary calculations such as the rasi chart, Hora chart, Upagraha Chart , Drekkana chart, Chaturthamsa chart, Saptamsa chart, Navamsa chart, Dasamsa chart, Dwadasamsa chart, Shodasamsa chart, Vimsamsa chart, Chatur Vimsamsa chart, Bhamsa chart, Trimsamsa chart, Khavedamsa chart, Akshavedamsa chart, Shashtiamsa chart, Ashtakavarga Charts and Tables. The Jaimini Karakas, Jaimini Padas and Aruda chakra according to the Jaimini system of astrology is also calculated. This makes it a unique Hindu Astrology Software. Calculates the values present in the shodashvarga table and prepares the shodashvarga table. Also calculates the lords of the shodashvarga and presents it in a chart format for easy reference. Astro-Vision LifeSign Horoscope includes calculation of the vargottama. The varga bheda values are calculated and the varga bheda table is also prepared. A brief summary of Vimshottari Dasa Periods is given. Details of the Paryanthardasa within each Bhukti ( Apahara ) is given. Analysis of planetary disposition, planetary analysis, planetary friendship analysis, planetary strengths, Kuja Dosha Check, Check for Moudhyam (combustion), planetary war, Grahavastha are provided. Includes a large database of cities from all over the world. So, you don't need to enter latitude, longitude and time zones of major cities. Additional cities can also be added, making the list of cities fully customizable. It makes the task of preparing a computer horoscope easier. Includes a nazhika to hour converter or ghati vighati convertor for easy cross reference. Various ayanamsa settings are included, such as Chitra Paksha ayanamsa or Lahiri ayanamsa, Raman ayanamsa, Krishnamurthy ayanamsa and Thirukanitham ayanamsa. Details of paryanthar dasa can be presented for up to 25 years from the present or from the age of 1 to 25 years, etc. This is fully customisable and provides maximum flexibility. Select the age up to which analysis is performed for favourable periods for marriage while preparing the computer horoscope. The LifeSign 14.0 horoscope includes a detailed Kuja dosha analysis. The report lets you know the chances for Kuja Dosha based on lagna, moon and shukra and provides remedies if Kuja Dosha is present in the horoscope. The LifeSign 14.0 report checks for the possible Rahu and Ketu doshas that affect the native’s married life. The report helps to know these doshas and suggests remedies for it. Astro-Vision LifeSign 14.0 horoscope lets you know the Jupiter transit through various houses, including its starting and ending periods and analysis details. Jupiter transit through various houses has its effects on various fields of life. Astro-Vision LifeSign 14.0 horoscope helps to know the favourable periods in career, business, marriage, house construction etc. resulting from the Jupiter transit. एस्ट्रो व्हिजन ज्योतिषशास्त्र सॉफ्टवेअर विकास आणि त्याच्या प्रमुख सॉफ्टवेअरमध्ये अग्रणी आहे, एस्ट्रो-व्हिजन लाइफसाईन 14.0 चा वापर 10,000 समाधानी ग्राहकांद्वारे केला जातो. आमच्या उपयोजकांमध्ये जगभरातील ज्योतिष केंद्र, व्यवसाय केंद्र, इंटरनेट कॅफे, एसटीडी / पीसीओ बूथ, जिएरॉक्स केंद्र, विवाह ब्यूरो, ज्योतिष वर्ग, आणि ज्योतिषींचा समावेश आहे. आमच्या ज्योतिषशास्त्रीय सॉफ्टवेअरने आमच्या ग्राहकांना व्यावसायिकरित्या संगणकीकृत ज्योतिष सेवा देण्यास सक्षम करते. आमच्या विशाल क्लाएंट बेसमध्ये एस्ट्रो-व्हिजन लाइफसाईन हे सर्वोत्तम फलज्योतिषी सॉफ्टवेअर उपलब्ध आहे ह्याची साक्ष देतात. एस्ट्रो-व्हिजन लाइफसाइन 14.0 अचूक आणि पूर्ण पत्रिका गणना आणि अंदाज देते. आमचे फलज्योतिष सॉफ्टवेअर भारतीय भविष्य वर्तविण्याच्या फलज्योतिषशास्त्रावर आधारित आहे. एस्ट्रो-व्हिजन लाइफसाइन 14.0 सह, आपण आपल्या ग्राहकांकडील विविध भाषांमध्ये तपशीलवार कुंडली अंदाज प्रदान करून पहिल्या दिवसापासून उत्पन्न कमावू शकता. जर तुमच्याकडे आधीच होम-आधारित व्यवसाय आहे किंवा डीटीपी केंद्र आहे, इंटरनेट कॅफे किंवा पीसीओ बूथ, अॅस्ट्रो-व्हिजन लाइफसाइन 14.0 ज्योतिष सोफ्टवेअर आपल्या विद्यमान ग्राहकांना कुंडली सेवा पुरवून मिळविण्याचे एक आदर्श मार्ग प्रदान करते. दुकानदार आणि विक्रेते यांना देखील आपल्या गुंतवणुकीवर उच्च परतावा मिळविण्यासाठी उपयुक्त असे ज्योतिष सॉफ्टवेअर सापडेल. एस्ट्रो-व्हिजन लाइफसाइन 14.0 आपल्याला आवश्यक असलेल्या कुंडली अहवाल सानुकूल करण्याचा पर्याय देतो; उदा. सिंगल-पेज जन्मकुडली अहवालाप्रमाणे, जन्मकुंडली अहवाल फक्त चार्ट्स आणि गणितांबरोबरच, जन्मपूर्व भविष्यवाणासह कुंडली अहवाल, इ. आपण एस्ट्रो-व्हिजन लाइफसाइन 14.0 मध्ये उपलब्ध टेम्पलेट्समधूनही निवडू शकता. हे आपल्याला वेगवेगळ्या प्रकारच्या जन्मकुंडली अहवाल आपल्या ग्राहकांना वेगवेगळ्या किंमतींमध्ये वितरीत करण्यात मदत करेल. अहवालाच्या प्रकारानुसार निरनिराळ्या दरांमध्ये 750 रु. ते 10 रूपयांपर्यंत व्याज आकारले जाते. एस्ट्रो-व्हिजन सॉफ्टवेअर लाइफसाइन 14.0 एकापेक्षा जास्त भाषांमध्ये उपलब्ध आहे- इंग्रजी, हिंदी, तामिळ, मल्याळम, तेलगू आणि कन्नड. म्हणून आपण संपूर्ण देशभरातील ग्राहकांसाठी ज्योतिष सेवा देऊ शकता. हिंदू ज्योतिषशास्त्र सॉफ्टवेअर नंतर हे वैशिष्ट्य सर्वात महत्वपुर्ण बनते. विविध चार्ट शैलीतील संगणकीय जन्मकुंडली तयार करा. एस्ट्रो-व्हिजन लाइफसाइन 14.0 तुम्हाला उत्तर भारतीय, दक्षिण भारतीय, बंगाली, केरळ आणि श्रीलंका यांसारख्या कुंडली प्रकारातील कुंडली निवडी देतो. याचा अर्थ आपण आपल्या ग्राहकांच्या वैयक्तिक गरजेनुसार एस्ट्रो-व्हिजन सॉफ्टवेअरमधून होणारी कुंडली अहवाल निर्माण करू शकता. जन्मकुंडलीच्या अहवालांची रचना करा आणि ती सीडी, फ्लॉपी, हार्ड डिस्कवर जतन करा किंवा फक्त प्रिंट आउट काढा. आपण हे अहवाल मेलद्वारे ग्राहकांना पाठवू शकता, जेणेकरून ते त्यांच्या सोयीनुसार अहवालाची प्रिंटआउट पाहतील आणि घेतील. हे तुमची व्याप्ती आणि कार्यक्षेत्र वाढवते. यूजर इंटरफेस अगदी सोपा व सहज आहे. एस्ट्रो-व्हिजन सॉफ्टवेअरचा उपयोग करण्यास आपल्याला पूर्वीच्या एखाद्या ज्योतिषशास्त्राचे पुर्वीचे ज्ञान असणे आवश्यक नाही. एस्ट्रो-व्हिजन ई-मेल आणि टेलिफोनद्वारे फॉलो-ऑन-सेल्स सपोर्ट प्रदान करते. शाखांच्या विस्तृत नेटवर्क, वितरक आणि वितरक विविध एस्ट्रो-व्हिजन फलज्योतिष सॉफ्टवेअर उत्पादनांसाठी देखील मदत करतात. एस्ट्रो-व्हिजन लाइफसाइन साइनऑन कुंडलीमध्ये पंचांग भविष्यवादाचा समावेश आहे, आठवड्याच्या दिवशी, जन्मनक्षत्राच्या आधारित अंदाज, तिथीवर आधारित अंदाज, म्हणजेच चंद्राचा दिवस, करणांवर आधारित अंदाज आणि निथ्य योगाच्या आधारे अंदाज. व्यक्तिमत्त्व, भौतिक रचना, स्थितीबद्दलच्या अंदाजांसाठी, प्रथम घराचे विश्लेषण. संपत्ती, जमीन आणि मालमत्तेच्या अंदाजांकरिता दुसऱ्या घराचे विश्लेषण. मालमत्ता, शिक्षण इत्यादीच्या अंदाजांकरिता चौथ्या घराचे विश्लेषण. विवाह व विवाहीत जीवनावरील अंदाजासाठी, सातव्या घराचे विश्लेषण. दिर्घायुष्य, अडचणी यांवरील अंदाजासाठी आठव्या घराचे विश्लेषण. भविष्यसूचक, समृद्धी, वारसा, इत्यादीबद्दलच्या भविष्यवाण्यांसाठी नवव्या घरांचे विश्लेषण. व्यवसायाबद्दलच्या अंदाजांकरिता दहाव्या घराचे विश्लेषण. व्यय आणि नुकसानाबद्दलच्या अंदाजांकरिता बाराव्या घराचे विश्लेषण. एस्ट्रो-व्हिजन लाइफसाइन सॉफ्टवेअर वर्तमान दशापासुन सुरु होणाऱ्या दशा आणि अपहराराच्या प्रभावावर आधारित तपशीलवार अंदाज देते. अपहरा (भुक्ती) साठीचे अंदाज देखील पंचवीस वर्षांसाठी दिले जातात. प्रत्येक अपहराची वेळ मोजली जाते. (जीवनाचे पहिले पाच वर्षे वगळले जातात). दशा व अपहराचा प्रभाव पडताळून पाहताना, सप्त वर्गातील ग्रहांच्या ताकदीने त्यांची मते त्यावरुनच निर्णायक ठरतात. एस्ट्रो-व्हिजन लाइफसाइन सॉफ्टवेअर जन्म नक्षत्रांवर आधारित उपाय देते उपाय सांगण्यासाठी पूजास्थानाच्या सुचविलेल्या ठिकाणांना भेट द्या, योग्य पोशाख व योग्य मंत्र जपून ठेवा. त्या कालावधीमध्ये प्रतिकूल दशा कालावधी आणि उपचारात्मक उपक्रम देखील दिले जातात. या उपाययोजनांमध्ये दशा कालावधीत सुचविलेला पोशाख, देवता भजन, सकाळच्या प्रार्थना करतांना विशिष्ट सूचनांसह जप करणे आवश्यक आहे. एखाद्याला खाण्यातील अन्नपदार्थाविषयी विशिष्ट सूचनांसह उपवास करावा हितकारक दशा काळात केल्या जाणाऱ्या उपासना, सेवा तसेच पूजा यांवर सूचना दिल्या जातात दशा काळात मंत्रमुग्ध केले जाणारे मंत्रदेखील दिले जातात. सुचविलेले सर्व उपायदेखील त्या वेळेस नमूद केलेले आहेत ज्यात त्याचे पालन करण्याची आवश्यकता आहे. एस्ट्रो-व्हिजन लाइफ साइन ज्योतिषशास्त्र सॉफ्टवेअर जन्माच्या चार्ट्ससह असलेल्या ग्रहांच्या सध्याच्या स्थितीच्या तुलनेत ट्रान्झिट अंदाज पुरवतो. हे नजीकच्या भविष्याचा अंदाज लावण्यासाठी वापरले जाते. एस्ट्रो-व्हिजन लाइफसाइन सॉफ्टवेअर विविध दशा आणि अपहरा कालावधीमधील करिअरसाठी अनुकूल कालावधी दर्शवतो. एस्ट्रो-व्हिजन लाइफसाइन सॉफ्टवेअर विविध दशा व अपहरा काळात लग्न होण्याचा अनुकूल कालावधी दर्शवितात. एस्ट्रो-व्हिजन लाइफसाइन सॉफ्टवेअर विविध दशा व अपहरा काळात व्यावसायीक घडामोडींसाठी अनुकूल कालावधी सूचित करतो. एस्ट्रो-व्हिजन लाइफसाइन सॉफ्टवेअर विविध दशा आणि अपहरा काळात गृहनिर्मितीसाठी अनुकूल कालावधी सूचित करतो. आमचे संगणकीय जन्मकुंडली सॉफ्टवेअर अष्टकवर्ग प्रणालीवर आधारित अंदाज प्रदान करते. अष्टकवर्गाची पद्धत भारतीय ज्योतिषशास्त्राची एक संभाव्य पद्धत आहे जी ग्रहांच्या स्थानावर आधारित पॉइंट्सचा वापर करते. एस्ट्रो-व्हिजन लाइफ साइन ज्योतिष सॉफ्टवेअर हे अशाप्रकारचे ज्योतिष अंदाज पुरवणाऱ्या काही भारतीय ज्योतिष सॉफ्टवेअरपैकी एक आहे. योगाचे महत्त्वपूर्ण मिश्रण म्हणजे योग जन्मकुंडली मध्ये ओळखले जातात आणि त्यास होणाऱ्या प्रभावाचा थोडक्यात उल्लेख आढळतो. योगांची सूची करताना, एकत्रीकरण म्हणजेच योग हे सोप्या संदर्भासाठी दिले जातात. जन्मनक्षत्रांची गणना करते आणि संबद्ध नक्षत्र गुणांची संपूर्ण यादी देखील प्रदान करते. लाइफसाइन जन्मकुंडलीमध्ये दिलेले सर्व चार्ट्स, गणना व विश्लेषण वैदिक ज्योतिषशास्त्रावर आधारित आहेत. ग्रहांच्या निरायन रेखांश, राशी, राशीतील रेखांश, नक्षत्र तसेच नक्षत्र पदाची गणना केली जाते. नक्षत्र, नक्षत्र स्वामी, उप-नक्षत्र तसेच उप-उप नक्षत्र यांनी प्रत्येक ग्रहासाठी गणना केली जाते. दशा तसेच जन्माच्या वेळी दशा संतुलन हे सुद्धा राशी चार्ट आणि नवांश चार्ट यांसह दिले जातात एस्ट्रो-व्हिजन लाइफसाइन देखील भाव चार्ट तसेच भाव सारणी प्रदान करते. राशी चार्ट, होरा चार्ट, उपग्रह चार्ट, ड्रेक्कना चार्ट, चतुर्थामंसा चार्ट, सप्तमसा चार्ट, नवमसा चार्ट, दशंसा चार्ट, द्वादंसा चार्ट, षोडसंसा चार्ट, विमसंसा चार्ट, चतुर विमसंसा चार्ट, भम्सा चार्ट, त्रिमंसा चार्ट, खावेदंसा चार्ट, अक्षवेदंसा चार्ट, षष्टीमंसा चार्ट, अष्टकवर्ग चार्ट्स आणि सारण्या यासारख्या आवश्यक गणना केल्यानंतर वेगवेगळे चार्ट तयार केले जातात. .
ज्योतिषशास्त्राच्या जैमिनी पध्दतीनुसार जैैमिनी कराकाज, जैमिनी पदा आणि अरुदा चक्र यांची देखील गणना केली जाते. यामुळे हे एक अद्वितीय हिंदू ज्योतिषशास्त्र सॉफ्टवेअर बनते. षोडसवर्ग सारणीमध्ये असलेल्या मूल्यांची गणना करते आणि षोडसवर्ग सारणी तयार करते. तसेच षोडसवर्गाच्या स्वामीची मोजणी करून ती सहजपणे संदर्भित करण्यासाठी कुंडली स्वरूपात सादर करते. वर्गाबद्दलचे मूल्य मोजले जाते आणि वर्गभेद सुद्धा तयार केला जातो. विमशोत्री दशा कालाावधीचा संक्षिप्त सारांश दिला आहे. प्रत्येक भुक्ती (अपहरा) मधील पर्यांथरदशेची माहिती दिलेली आहे. ग्रहाची स्थिती, ग्रहाचे विश्लेषण, ग्रहाच्या मैत्रीचे विश्लेषण, ग्रहाची ताकद, कुज दोष तपासणी, मौध्यम (ज्वलन), ग्रहाचे युद्ध, ग्रहावस्था तपासणी केली जाते. जगभरातील मोठ्या शहरांच्या डेटाबेसचा समावेश आहे. म्हणून, मोठ्या शहरांतील अक्षांश, रेखांश आणि वेळ विभाग प्रविष्ट करण्याची आपल्याला गरज नाही. शहरांची सूची पूर्णपणे सानुकूल करण्यामुळे अतिरिक्त शहरेही जोडले जाऊ शकतात. यामुळे संगणकीय जन्मकुंडली तयार कऱण्याचे काम सोपे होते. सोप्या क्रॉस रेफरन्ससाठी नझीका ते तास कन्व्हर्टर किंवा घटी-विघटी कन्व्हर्टर समाविष्ट करतात. विविध अयांमासा रचना समाविष्ट आहे, जसे चित्र पक्ष अयांमासा किंवा लाहिरी अयांमासा , रमण अयांमासा , कृष्णमूर्ती अयांमासा आणि थिरुकनितम अयांमासा . जीवनशैली 14.0 जन्मकुंडलीमध्ये कूज दोष विश्लेषणांचा समावेश आहे. अहवालातून आपल्याला ज्ञान, चंद्र आणि शुक्ल यांच्या आधारावर कुज दोषांची माहिती मिळू शकते आणि कुज दोष जन्मकुंडलीमध्ये उपस्थित असल्यास उपाय देते. लाइफसाइन 14.0 अहवाल स्थानिक लोकांच्या वैवाहीक जीवनावर परिणाम होणाऱ्या राहु व केतु दोषांचा तपास करते. या दोषांची माहिती समजून घेण्यास आणि याबाबतचे उपाय सुचविण्यासाठी हा अहवाल मदत करतो. एस्ट्रो-व्हिजन लाइफसाइन 14.0 जन्मकुंडली तुम्हाला विविध घरांमधुन गुरूचे ट्रान्झीट माहिती करून देते, त्यामध्ये सुरूवात व शेवट कालावधी आणि माहितीचे विश्लेषण यांचा समावेश असतो. विविध घरांमधून गुरूच्या संक्रमणाचा विविध क्षेत्रातील जीवनावर परिणाम होतो. एस्ट्रो-व्हिजन लाइफसाइन 14.0 जन्मकुंडलीमुळे गुरू संक्रमणामुळे करियर, व्यवसाय, विवाह, घर बांधकाम इत्यादीतील अनुकूल कालावधी जाणून घेण्यास मदत होते. This professional panchanga & muhurtha software provides detailed horoscope calculations for astrologers.